Nature, advance online publication on Wednesday, June 20'th 2012; in print July 5'th. Contents of this website: a brief summary, an expanded outline, related images and movies, and links. We have discovered a new way to detect the first stars when the Universe was in its infancy at a mere 1% of its present age. Using powerful computer models we showed that an expected difference in the speed of gas and dark matter causes the first stars to clump together into a prominent cosmic web. The discovery of these web-like structures now makes it feasible for radio astronomers to detect the 21-cm wavelength light from hydrogen that was heated by the first stars when the Universe was only 200 million years old. The formation of stars is a part of our cosmic history. Astronomers know that long before there were stars, the early universe was filled with a hot, very uniform gas. In contrast, today we see a complex universe of stars and galaxies. A great unknown frontier is the era of the formation of the first stars, which marked the transformation of the universe to its current state. Currently, the most distant reliably detected galaxy is from a cosmic age of around 800 million years, and it is very difficult to go much earlier with detections of individual galaxies. Since the universe was filled with hydrogen atoms at those early times, the most promising method for observing the epoch of the first stars is using the prominent emission of hydrogen at a wavelength of 21 cm (corresponding to radio waves). Measuring the cosmic 21-cm emission is difficult, though, due to the foreground emission from our own Milky Way and other nearby galaxies. However, if the cosmic signal fluctuates then it is much easier to distinguish it from the bright local emission. 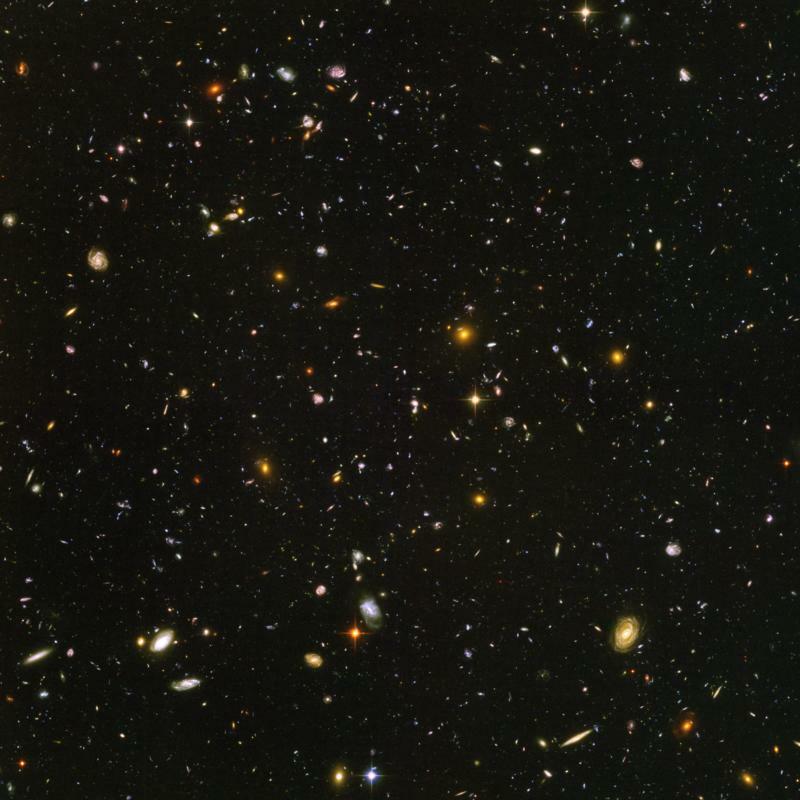 Indeed, the first stars and galaxies are expected to show large fluctuations, so that some regions contain many stars (collected into mini-galaxies, each much smaller than current galaxies such as the Milky Way), and other regions are nearly empty. The reason can be understood from an analogy: Imagine searching on Earth for mountain peaks above 5000 meters. The 200 such peaks are not at all distributed uniformly but instead are found in a few distinct clusters on top of large mountain ranges, with none found over the rest of the Earth's surface. The point is that given a mountain range, every small hill on top of it becomes a high mountain peak, while in a valley it would be just a small hill. Similarly, in order to find the early galaxies, one must first locate a region with a large-scale density enhancement, and then galaxies will be found there in abundance; the higher overall density enhances gravity throughout the region and makes it easier to form high concentrations of dark matter, into which gas falls and forms stars. This idea is made more effective by a recent insight that dark matter and ordinary matter (gas) move at different velocities in the early universe. The effect of this velocity difference has been studied over the last two years with analytical models and numerical simulations. In our paper we produced the first simulated 3-D maps of the distribution of the first stars and showed that the relative velocity effect significantly enhances large-scale fluctuations. In particular, during the era of the first heating of the intergalactic hydrogen by X-rays associated with star formation, prominent fluctuations are expected on a very large spatial scale that corresponds to 400 million light-years in today's universe. This would be observed on an angular scale of 2/3 of a degree (the sun and moon subtend about 1/2 a degree), which makes the signal relatively easy to observe (since exquisite resolving power is not necessary). Thus, this spatial structure makes it much more feasible for radio astronomers to detect early stars from a cosmic age of around 180 million years (1.3% of the current age of the Universe). The expected signal comes with a characteristic signature that would mark the existence of small mini-galaxies at that time and the presence of the velocity effect. This exciting possibility should stimulate observational efforts focused on this early epoch. Related images can be found here. Related movies can be found here.